Northwest New Jersey Christmas Tree Farms: choose-and-cut Christmas trees, Tree lots with pre-cut trees, stands, sleigh rides, hay rides and related winter events and fun! Whether you want to cut your own tree, pick a live tree and have it cut for you, buy a tree already cut or buy a living tree you can plant, this page provides detailed listings of Northwest New Jersey's choose-and-cut Christmas tree farms, places to buy pre-cut (also called pre-harvested and fresh-cut) trees, stands, sleigh rides, hay rides and related winter events and fun. Some listings are for tree farms, others are tree lots, and some only offer hay rides, sleigh rides or other winter events. READ EACH LISTING to know what each facility offers. The farms are listed further down this page, so scroll down the page! Since this service is free and open to ALL Christmas tree farms, not just those who belong to an association or pay for an ad, like almost all other websites do, this is the most complete and current listing available! I'm always looking for more to add, and to correct any inaccuracies or errors, so if you encounter any, please email me ! And please tell the farmer you visit in Northwest New Jersey that you found their farm here! I need the farmers to realize that you found them here so that they will keep their information up to date! 7 Beacon Light Road, Califon, NJ. Phone: 908-832-2298. Open: 9 am to 4:30 pm on Thursday to Sunday, (Other days by Appointment Only), from Friday after Thanksgiving until December 24. Directions: 7 miles north on Rte. 517 from Exit 24 (Oldwick) Rte. 78. Turn left on Beacon Light Road to first house on left. There are over 1500 beautiful trees from which to choose ranging from 6 to 12 feet plus in height. Varieties include Douglas Fir, Concolor Fir, Norway Spruce, and Colorado Blue Spruce. Most trees $80. Select trees priced at $50 and $60. Payment by cash or personal check. Click here for our Facebook page. U-Choose & Cut your own: Blue Spruce, Douglas-fir, Concolor Fir. 9 Black Oak Lane, Asbury, NJ. Phone: 908-537-4133. Open: from the day after Thanksgiving to December 18 from 9 am to 5 pm on weekends, Call during the week; Remember, it gets dark around 4:30 PM; You should arrive before 4 PM in order to see what you are choosing. All Trees are $50.00. We Are Closed Tuesdays & Wednesdays; If you like, please call to make an appointment for earlier purchase, or on closed days. Our Christmas Shop will be fully stocked this year! We will have Wreaths, Tree Stands and our usual array of hand-picked gift items, S&F Honey and, Of Course Mrs. Housedorf's Hand Rolled Beeswax Candles., from the day after Thanksgiving to December 18. Directions: Rte. 78 to Exit 12, turn North on Charlestown Road (County Rte. 635). Go approximately 3 miles to Mine Road (3rd road left). Turn left on Mine Road. Go 7/10 mile to Black Oak Farm on left. Payment: Cash, only. -Choose & Cut your own: Blue Spruce, Norway Spruce, Douglas-fir, Concolor Fir, Fraser Fir, Canaan Fir, Mexican Border Pine. Comments from a visitor on December 02, 2008: "Black Oak Farm great choice, great helpers and tree quality Mac's Trees family field, nice couple Absolutely the best tree website! Bookmarked for next year. Your tips gave such value. Helped us finally agree on tree type and size [calculation guide]." 608 Milford-mt. Pleasant Road, Milford, NJ 08848. Phone: 908-892-8175. Open: Every Saturday and Sunday 9 am to 5 pm after Thanksgiving till The day before Christmas. Directions: Route 78 Exit 11 Pattenburg - Travel South on Route 614 under Train tunnel in Pattenburg up the draw to top of Hill with 4 way stop, left onto Route 579 and a quick right onto Hickory Corner Road - Travel to stop sign at Alexandria Township Park turn left again and then a quick right South onto 519 heading towards the town of Milford. 608 Milford-Mt. Pleasant Road is on your left half way down the road. Click here for a map and directions. Payment: Cash, Check. You-Choose and You-Cut varieties: Canaan Fir, Colorado Blue Spruce, Fraser Fir, Incense Cedar, Norway Spruce. You Choose and We cut varieties: Canaan Fir, Colorado Blue Spruce, Fraser Fir, Incense Cedar, Norway Spruce. 231 Adamic Hill Road, Milford, NJ. Phone: 908-995-4365 or 610-258-7305. Open: 10 am to 4:30 pm (Friday, Saturday, Sunday), from the day after Thanksgiving to December 24. Directions: Rte. 78 W to Alpha, South on Rte. 519 thru Warren Glen. Top of hill, turn right on Anderson Road. Left on Shire Road and immediate right on Adamic Hill Road 1.2 miles to farm. We are a choose and cut farm. You pick and cut your tree in the field and then the wagon will pick you and your tree up and bring you back to the baler. U-Choose & Cut your own: Douglas-fir. Quakertown/Cherryville Road at W. Sidney Road, Franklin Township, NJ. Phone: 908-806-4580. Open: 9:30 am to 4:30 pm on Saturday and Sunday (closed on Monday to Friday), Saturday after Thanksgiving to December 19th. Directions: Rte. 78 Exit 15 onto Rte. 513 S 5 miles to Pittstown - left onto 579 S 2 miles past firehouse and school into Quakertown. Straight onto Rte. 616 for 1 mile Cherryville Farms sign on right. Pricing: Approximately $7.50/foot. Payment: Cash or Check only. ATM in nearby Pittstown. Cherryville Farms, family owned and operated, is a permanently preserved working agricultural farm. We are not a tree lot! Our five species of quality trees are a "must see". They are grown with a variety of trimming styles. Short or tall - skinny or full - hand sheared or natural, we have a tree for you! Quality Trees ; Wreaths - Crafts - Refreshments - Wagon Rides. Come out and enjoy the day, cut your own, or we'll cut it for you! Click here for a link to our Facebook page. Comments from a visitor on November 28, 2010: " One of the best organized farms we've been to! Entrance road well maintained/marked, tree rows labeled, each tree tagged by color & price. Adaquate tree spacing and care. Tree carts and saws provided. Welcomer [yes you are welcomed] provides brief introduction to layout, pricing, helper availability and if you have any questions. Pricing was appropriate, our 7 foot was $68. This is now our go-to tree farm. Thank you for your definitive Christmas tree site! And you are so right to remind everyone to call before you travel." 478 County Road 579, Alexandria Twp, NJ. Phone: 908-735-5706. Email: coles.treefarm.jh@gmail.com. Open: Call them for 2019's dates and hours; I have not received an update from them in years; last reported hours were 9 am to 4:30 (daily), November 24 to December 23. Directions: Route 78E, Exit 12, turn left at end of ramp. Turn left at stop light onto Rte. 625 S & Perryville Road. From Route 78W, Exit 12, turn left at end of ramp. Turn right at stop light onto Rte. 625S & Perryville Road Go 1/4 mi. and bear right. Rte. 625S. Go 1 and 1/2 mi. to stop sign, turn right onto Rte. 579N. Go 2 mi. - farm on left. Look for white fence. 14 Pulaski Road, Whitehouse Station, NJ. Phone: 908-534-2523. Open: Call them for 2019's dates and hours; I have not received an update from them in years; last reported hours were 12 pm to 5 pm (Monday to Friday), 9 am to 5 pm (Saturday and Sunday), December 2 to 17. Directions: From Flemington Circle, #523 N. 9 miles to Pulaski Road, make Route farm on Route 0.2 mile From Somerville 22 W. to Whitehouse Station 523 S. 1 mile Pulaski Road, turn left, farm on Route 0.2 mile Click here for a link to their unofficial Facebook page . 159 Old Franklin School Road, Pittstown, NJ 08867. Phone: (908) 442-1331. Email: DuncansFarmNJ@gmail.com. Open: Friday after Thanksgiving and then Saturdays and Sundays 10:00 til 4:00. Directions: 4 driveways in from Croton road . . . signs on fence out front. Click here for a map and directions. We use natural practices, but are not yet certified Organic. Payment: Cash, only. No frills this year, just trees! Any size tree only $20. includes tax. DIY, you choose, cut, carry. No restroom. Dogs on leash welcome. U-Choose and Cut varieties: Balsam Fir, Black Hills Spruce, Blue Spruce, Canaan Fir, Douglas Fir, Fraser Fir, Turkish Fir. 125 Cole Rd (Readington physical location), Flemington, NJ 08822. Phone: 908-963-2901. Email: edgewoodfarm125@aol.com. Open: Friday after Thanksgiving, Saturday and Sunday 9 am to 4,, as well as all weekends until Christmas.. Click here for current open hours, days and dates. Directions: For a map to our farm, click here. Payment: Cash, only. Click here for our Facebook page. in 2017, Trees are $50 for any size cut from the field. We also have 8'-9' fresh, hand picked Fraser Firs priced at $60 and 10'-12' Douglas Fir Trees priced at $75 . You Choose and We cut varieties: Blue Spruce, White Fir (Concolor Fir), Douglas Fir, Fraser Fir, Norway Spruce. 39 Thomas Road, Glen Gardener, NJ. Phone: 908-537-2706. Open: Call them for 2019's dates and hours; I have not received an update from them isince 2013; last reported hours were 10 am to 4 (Saturday and Sunday), Saturday after Thanksgiving to December 17. Directions: I-78 Exit 17 to Rte. 31N - left at 5th light (Glen Manor Drive) to top of hill - left onto Black Brook Road - approximately 1/2 mile - left onto Thomas Road Driveway on left. U-Choose & Cut your own: Blue Spruce, Norway Spruce, White Spruce, Douglas-fir, Concolor Fir, Fraser Fir. 4 Bass Lane, Lebanon, NJ. Phone: 908-236-9550. Email: info@theevergreenfarm.com. Directions: Rte. 78 W to Exit 20A (Lebanon). Turn right at first light onto Rte. 22 W. Turn left (jughandle) at first light (Round Valley). Go 3.3 miles on Rte. 629 to Bass Lane OR Rte. 31 N from Flemington to Molasses Hill Road. Take to end. Turn right onto Rte. 629 to Bass Lane, Click here for current hours and directions. Open: 10 am to 5 (Friday, Saturday, Sunday), November 18 to December 17; Closed Thanksgiving, but open Friday the day after Thanksgiving; Open by appt November 1 for tagging to reserve your tree. We'll help by cutting it, carrying it down the hill, trimming branches off as you like, baling it, drilling a hole in its base if you'd like, and even tying it onto your car! While we work, you can enjoy hot cider - made from our own apples - and freshly baked cookies right out of the oven while you stay warm by the fire. We've got lots more! We also offer pre-cut trees in addition to the choose & cut trees. We carry wreaths, roping, tree stands, ornaments, lights, and live balled trees. We've got a small gift shop. We'll make custom wreaths for you, and grave blankets for your loved ones. Give us a call - we'll prepare just what you want! U-Choose & Cut your own: Blue Spruce, Douglas-fir, Concolor Fir, Fraser Fir. 258 County Road 579, Ringoes, NJ 08551. Phone: 908-782-5082. Email: everittequipment@gmail.com. Open: the day after Thanksgiving - Christmas Monday to Friday Noon - 7 pm Saturday and Sunday 8 am to 7 pm. Directions: Click here for a map and directions. Payment: Cash, Check, Debit cards, Visa/MasterCard, Discover, AmEx. Click here for our Facebook page. You-Choose and You-Cut varieties: Fraser Fir. 710 Milford Mount Pleasant Road, Milford, NJ 08848. Phone: (908) 996-6199. Alternate Phone: (908) 403-6653. Email: kstirby@aol.com. Open: weekends from Thanksgiving till Christmas, from 10 am till 4 pm or call for an appointment for a weekday. Directions: Route 78 to exit 11, follow signs for Pattenburg 614, follow to the 4 way stop sign and make a left on 579, then make your first right on Hickory Corner Road, follow Hickory Corner Road till the end, make left on 513 then a quick right on 519, our long gravel driveway is the sixth on the left. There is a hay wagon and a sign that says, "The Farm". Click here for a map and directions. We do not use pesticides on the crops. Payment: Cash, only. Early tagging available. Call Karen. Hot cocoa, cider, tea & coffee available. Beautiful full trees that are available to cut this year are Norway Spruce, Douglas Fir, Blue Spruce and Concolor Fir. Sizes range from apartment size to 16 feet. Forty dollars for the first 6 feet, five dollars per foot after that. Click here for our Facebook page. We have hundreds of Norway Spruce, Douglas Fir and Blue Spruce to choose from. They come in small apartment size trees and range up to Rockefeller Center size! All trees up to six feet cost $40, and then it is an additional $5 per foot thereafter. You can cut the trees yourself or we can cut them for you. You-Choose and You-Cut varieties: Balsam Fir, Blue Spruce, Canaan Fir, Douglas Fir, Fraser Fir, White Fir (Concolor Fir), and other varieties (call!). You Choose and We cut varieties: Balsam Fir, Blue Spruce, Canaan Fir, Douglas Fir, Fraser Fir, White Fir (Concolor Fir), and other varieties (call!). 258 County Raod 579, Ringoes, NJ 08551. Phone: 908-782-5082. Email: FirBrothers@gmail.com. Open: We are open the day after Thanksgiving - Christmas Eve Weekdays: noon - 7:30pm Weekends: 8 am to 6 pm. Directions: Click here for a map and directions. Payment: Cash, Check, Debit cards, Visa/MasterCard, Discover, AmEx. Locally grown Douglas & Fraser Fir trees up to 14'! We also offer wreaths, grave blankets, roping and more! 93 Red Mill Rd, Glen Gardner, NJ 08826. Phone: (908) 537-2056. Open: Friday, Saturday, and Sunday Now till the Sunday before Chistmas. Directions: Take Route 31 North from 78 in the Clinton area approximately 3.5 miles to Glen Gardner. Turn right at School Street and follow signs approximately 2.5 miles more. It's worth it. Click here for a map and directions. We use natural practices, but are not yet certified Organic. Payment: Cash, Check. We are the oldest (started in the late 30's) Christmas Tree Farm in the area and possably in the country. We have all sizes and 1000's full shaped trees to choose from. Most of our trees are priced at $45.00 with the exception of large trees over 8 feet and Concolor Fir which are slightly more. We welcome you to come and enjoy our farm and start a great tradition for your family. Wreaths, grave blankets, mailbox huggies and mantle sprays are handmade using fresh cut greens. Pet friendly - leashed pets welcomed. You-Choose and You-Cut varieties: Balsam Fir, Blue Spruce, Colorado Blue Spruce, Douglas Fir, Eastern White Pine, Norway Spruce, White Fir (Concolor Fir), White Pine, White Spruce. You Choose and We cut varieties: Balsam Fir, Blue Spruce, Colorado Blue Spruce, White Fir (Concolor Fir), Douglas Fir, Eastern White Pine, Norway Spruce, White Fir (Concolor Fir), White Pine, White Spruce. 534 County Road 614, Asbury, NJ. Phone: (908) 735-6900. Email: bharding67@gmail.com. Open: Monday to Saturday from 8 am to 6 pm; Sunday from 9 am to 5m. Christmas Shop - Our Xmas shop opens Saturday after Thanksgiving. Choose from a large selection of live & cut Xmas Trees, custom-made wreaths, grave blankets, center pieces, mantle pieces, roping, floral arrangements, candles, cards, gifts & more. To busy to decorate, call us in for a free residential or corporate consultation and we will deck the halls for you! Bring the kids and picnic while fishing the pond and visit with the farm animals. We are also pet friendly! We host several events for holidays such as Christmas, Easter, Halloween and Mother's Day. 97 Haytown Road, Lebanon, NJ 08833. Phone: 908-236-6602. Email: stanbc@juno.com. . Open: Note: they may have closed down; I cannot find any updates abnout them; In December, Saturday, from 9 am to 5 pm; Sunday, from 1 pm to 5 pm; and by appointment; Please call for week day appointments. Directions: From Route 22, go one mile north of Lebanon, NJ on Cokesbury Road, or 0.7 mile north from westbound Route 78 exit 20B. Turn left onto Haytown Road for 1.7 miles. The farm and tree field are on the left. Two stone pillars mark the driveway. Click here for a map and directions. We minimize use of pesticides and other chemicals. Payment: Cash, only. Greens are available, and crafts are sometimes available. We assist in mowed field. You Choose and We cut varieties: Blue Spruce, Canaan Fir, White Fir (Concolor Fir), Douglas Fir, Fraser Fir, White Pine. You-Choose and You-Cut varieties: Black Hills Spruce, Blue Spruce, Canaan Fir, Colorado Blue Spruce, Douglas Fir, Fraser Fir, Norway Spruce, White Fir (Concolor Fir). You Choose and We cut varieties: Black Hills Spruce, Blue Spruce, Canaan Fir, Colorado Blue Spruce, White Fir (Concolor Fir), Douglas Fir, Fraser Fir, Norway Spruce, White Fir (Concolor Fir). 310 Oak Grove Road, Pittstown, NJ 08867. Phone: 908 268-9175. Email: jackieshorses68@yahoo.com. Open: Friday, Saturday, Sunday 10 am to 5 pm starting November 25. Directions: 310 oak grove road pittstown n.j. 08867 (exit 15) off of route 78 east or west, follow pittstown road for approximately 8 miles make right onto oak grove road farm is on corner. Click here for a map and directions. Payment: Cash, Check. bungee cords work great and quick for tying trees to cars!!!! come and enjoy an old fashioned christmas with the family and dog (leash please). need a larger tree? we got them!! 10-11 footers and full. All sizes,beautifully sheared. average 25$ to 55$. You Choose and We cut varieties: Blue Spruce, Norway Spruce. 1070 Route 523, Flemington, NJ 08822. Phone: 908-782-8312. Email: LynKozicki@gmail.com. Open: FOUR days only: Saturday/Sunday December 3 and 4 and Saturday/Sunday December 10 and 11; Noon - 4 pm. Directions: On Route 523 between Flemington & Whitehouse Station. For a map to our farm, click here. Payment: Cash, Check. You-Choose and You-Cut varieties: Blue Spruce, Colorado Blue Spruce, Douglas Fir, Fraser Fir, Norway Spruce, Scotch Pine, White Pine. You Choose and We cut varieties: Blue Spruce, Colorado Blue Spruce, Douglas Fir, Fraser Fir, Norway Spruce, Scotch Pine, White Pine. 10 Huff Lane, Asbury, NJ 08802. Phone: (908) 479-4655. Fax: 9084794655. Email: huff_ab@embarqmail.com. Directions: from Bloomsbury route 173 east left at Spain Inn left on valley station road farm on right. From Asbury route 632 west left on Wolverton road farm on left. And for a map to our farm, click here. Open: Monday to Friday from 8 am to 5 pm; Saturday from 9 am to3 pm; open from Thanksgiving until trees are all sold ; trees may be tagged. Payment: Cash, Check. You-Choose and You-Cut varieties: Colorado Blue Spruce, Douglas Fir, Norway Spruce, Scotch Pine. You Choose and We cut varieties: Colorado Blue Spruce, Douglas Fir, Norway Spruce, Scotch Pine. Rte. 629 at Cratetown Road, Clinton Township, NJ. Phone: 908-236-2794. Directions: From Rte. 287 - Rte. 22W to Lebanon to Rte. 629. 5 miles to farm on right. From Rte. 31N Flemington to Cratetown Road. Right to end of road. 1/2 mile to farm on left. Open: dawn-dusk (Saturday and Sunday, most weekdays), November 24 to December 24. U-Choose & Cut your own: Blue Spruce, Norway Spruce, Scotch Pine. 70 Manners Road, East Amwell, NJ 08551. Phone: (973) 796-4899. Alternate Phone: 973-584-5111. Fax: 973-584-5333. Email: info@martinfamilytreefarm.com. Open: Friday, Saturday and Sunday, from 10 am to 4 pm, November to December from Black Friday to the weekend before Christmas. Directions: Click here for a map and directions. Payment: Cash, only. You-Choose and You-Cut varieties: Blue Spruce, Canaan Fir, Colorado Blue Spruce, Norway Spruce. 1009 Rte. 579, Quakertown, NJ. Phone: 908-806-TREE. Open: Call them for 2019's dates and hours; I have not received an update from them in years; last reported hours were 12 to 6 (Monday to Friday), 10-8 (Saturday and Sunday), from the day after Thanksgiving to December 23. Directions: Between Croton & Quakertown. From Flemington W on Rte. 12, 2 miles to light at Croton. Take Rte. 579 North. Farm 1 and 1/2 miles on left. U-Choose & Cut your own: Blue Spruce, Norway Spruce, White Spruce, White Pine, Douglas-fir, Fraser Fir. 323 Hackett Road, Hampton, NJ 08827. Phone: 908-537-4479. Email: wbaumgarten@hotmail.com. Open: Call them for 2019's dates and hours; I have not received an update from them in years; last reported hours were Thanksgiving through Christmas - all daylight hours. Directions: Route 78 to exit 12 - north on Charlestown Road ( HC 635 ), 2 miles to right turn on Hackett Road - 1 mile to 323 Hackett Road on left. Signs along route. Click here for a map and directions. Payment: Cash, only. You-Choose and You-Cut varieties: Balsam Fir, Blue Spruce, Canaan Fir, Colorado Blue Spruce, Eastern White Pine, Fraser Fir, Nordmann Fir, White Fir (Concolor Fir), White Pine, White Spruce. 37 Philhower Rd., Tewksbury, New Jersey. Phone: 908-672-9294. Open: Call them for 2019's dates and hours (they aren't published on their website). Once you select your tree of the season, we will cut it down for you and put it on our shaker to remove any loose needles or accumulated leaves or bird's nests or maybe small animals. Once shaken and not stirred, it's through the baler to get a net to swiss replica watches hold the branches tightly together and then we'll tie it to your roof for you. We do all the work�unless you would prefer the complete, authentic experience yourself. In which case we'll try and provide whatever help you need and cheer you on. You-Choose and You-Cut varieties: Douglas Fir, Frasier Fir, Balsam Fir, Concolor Fir, White Pine, Vanderwolf Pine & Blue Spruce. 384 Penwell Road, Port Murray, NJ. Phone: 908-763-3064. Open: Call them for 2019's dates and hours; I have not received an update from them in years; last reported hours were 8 am to 4:30 pm (Friday and Saturday), 10 am to 4:30 pm (Sunday), November 24 to December 17 . Directions: Rte. 78 to Exit 24. Rte. 517 North thru Long Valley, up Schooley's Mountain to Pleasant Grove Road (approximately 12 mi. ), left on Pleasant Grove Road. 4 miles to farm on right. U-Choose & Cut your own: Douglas-fir, Concolor Fir, Fraser Fir. 438 Quakertown Rd, Flemington, NJ 08822. Phone: (908) 782-0707. Email: infor@petersonfarm.net. Open: Friday to Sunday, from 9 am to dusk; Black Friday to Christmas. Click here for current open hours, days and dates. Directions: Click here for a map and directions. Strawberry season is typically the month of June. Uses integrated pest management practices, Payment: Cash, Check, Debit cards, Visa/MasterCard, Discover, AmEx. Click here for our Facebook page. U-Choose and Cut varieties: Canaan Fir, Colorado Blue Spruce, Douglas Fir, Norway Spruce. You Choose and We cut varieties: Canaan Fir, Colorado Blue Spruce, Douglas Fir, Norway Spruce. PreCut varieties: Canaan Fir, Colorado Blue Spruce, Douglas Fir, Fraser Fir, Nordman Fir. Route 519, Rosemont, NJ. Phone: 609-397-1809. Email: dukeg@erols.com. Open: from the day after Thanksgiving until December 24th, from 9 am to 4:30 pm on Thursday-Sunday (even in miserable weather). Directions: From Flemington - Rte. 12 W to Rte. 523 right onto Rte. 604 to Rte. 519. Turn right onto Rte. 519. Farm 300 yards. From Trenton - Rte. 29N thru Lamberville and Stockton. Right onto Rte. 519 1.5 mi. to farm. Click here for a map. Once you've made your selection (and, since we don't charge by the hour, take as long as you'd like), you can take one of our bow saws to cut down the tree yourself, load the tree into one of our carts to bring it back to the tree farm shed, put the tree through the netting so it's easier to get it into the house, load it into or onto your car, and then return to the shed to fix yourself a cup of hot chocolate in celebration of a harvest well-done. If, at any point in this process you find that you'd like some help, our tree farm staff will be ready to lend a hand (except for picking out the perfect tree and the hot chocolate drinking parts which are strictly do-it-yourself). 1051 County Route 523, Flemington, NJ 08822. Phone: 908-782-2705. Fax: 908-788-8201. Email: contact@schaeferfarms.com. Open: see our website for current hours. Directions: Click here for a map and directions. Payment: Cash, Check, Visa/MasterCard. Santa is coming to Schaefer Farms on December 1, 2018 from 12 pm to 2 pm and December 15, 2018 from 1 pm to 3 pm. Bring your camera, photos with Santa will be available. Are you on his list? He's checked it twice! Bring your family to visit him . Bring your camera, photos with Santa will be available. Are you on his list? He's checked it twice! Bring your family to visit him so he knows what they want under your tree. Pick your own Christmas trees, wreathes, grave blankets, holiday crafts, decorations, firewood, and other holiday gifts! We will be closed on Monday's and Tuesday's starting December 1st. With deep regrets we will not be presenting Holiday Lights on the Farm this year. 50 Sawmill Road, Tewksbury, NJ. Phone: 973-751-4662. Directions: From Rte. 78 West to Exit 24 North on Rte. 523 to Oldwick. Continue north on 517 3 miles to Sawmill Road Left on Sawmill Road. Go 1/2 mile to plantation opposite school. Open: 8:30 am to 4:30 pm (Saturday and Sunday), December 1 to December 24. U-Choose & Cut your own: Blue Spruce, Norway Spruce, White Pine. 163 Old Franklin School Rd, Pittstown, NJ 08867. Phone: 908-788-4975. Email: jsndjmog@gmail.com. Open: every day - Monday to Sunday, 9 am to 5 pm, November 27 to December 24. Directions: From Route 78- Exit 15 Clinton/Pittstown. Turn left at traffic light off exit ramp.Follow into Pittstown approximately 5 miles. Turn left onto County Route 579; go up big hill and pass school on right. Continue on 579 whihc turns right in Quakertown. Turn right onto Old Fraklin School Road. It is the third driveway on the right. Click here for a map and directions. Payment: Cash, Check. You can choose and cut your own tree, or you can choose a tree, and we can cut it for you. If you wish, we have a tree baler which helps get a tree through doorways easier. We can bale a tree up to about 7 ft tall depending on width. The baling service is free. On weekends, members of the family are available to help lift the tree into/onto your car, SUV or truck. UYou-Choose and You-Cut varieties: Douglas Fir, Norway Spruce, White Fir (Concolor Fir), and other varieties (call!). 14 Allerton Road, Lebanon, NJ 08833. Phone: 908-238-9696. Fax: 908-238-9620. Open: call for hours and availability. Directions: Rt 31 to Allerton Road, 1 mile east, the farm is on the left. Click here for a map to our farm. 26 Plains Rd, Augusta, NJ 07822. Phone: 973-948-4222. Email: info@amjactreefarm.com. Open: Thanksgiving weekend Friday-Sunday and in December on Saturday and Sunday from 9 am to 4:30 pm, Weekdays by appointment only. Directions: From Route 80, take the exit for Route 15 North and follow until it ends, about 20 miles. Proceed straight onto Route 206 North and make a right at the first light onto Plains Road We are located 1/4 mile on the left. Click here for a map and directions. Open for Christmas trees weekends in December. Payment: Cash, only. We also sell handmade grave blankets, ornaments, and light refreshments including hot cocoa, coffee, tea, soda, and snacks. We have free candy canes for the kids! (or the kid at heart). Click here for our Facebook page . We are a family owned and operated farm in beautiful Sussex County in North West New Jersey. Our farm is located at the family residence with five acres of trees on top of a hill with beautiful views. Our farm was planted by our own hands in 1981 and we have been selling Christmas Trees since 1987. We take great pride in caring for our trees throughout the years by fertilizing, weeding, and shaping each one by hand! Each year we plant a new tree for every tree that was sold. Our farm is a U-Cut farm which means we provide the saw and you are able to freely roam around the farm, find your perfect tree, and you cut it down! Anyone needing assistance, just let us know, and we will be happy to help! We then wrap the tree and place it on/in your vehicle. We have twine to help with any tie down needs. 125 Hampton House Road (rt.206), NJ 07860. Phone: 973-895-3526. Alternate Phone: 201-9247510. Fax: 973-895-1904. Email: antrenllc@live.com. Open: Friday after Thanksgiving, then Saturdays and Sundays until through December 21, 10 am to 4 pm. Click here for current open hours, days and dates. Directions: Take Route 206 North, 4 miles past center of Newton on the left. From Route 80, Exit 34B to Route 15 North to end. Make left onto Route 206 South (at Chatterbox Restaurant and Ballpark). Continue 1 1/2 miles on Right to 125 Route 206 (Hampton House Road). Click here for a map and directions. Payment: Cash, only. We are located in beautiful Sussex County in Northwest New Jersey on 177 farmland acres with natural hills for beautiful views. Choose and cut the exact tree you want while you walk through the fields with your family. We will provide the saw, bail your tree in netting, load and help you tie your Christmas tree to your car for a safe ride home. No matter what size tree you decide on, regardless of height, all of our trees are $55 in 2017. Over the past 15 years, as trees are cut and sold, we plant a minimum of 500-1000 new trees each year. We have thousands of Douglas Firs, White Spruces, and Blue Spruce Christmas trees 5-7' and many 12' and taller. Any size tree on our lot is sold for the same price! We offer all our customers hot apple cider and Christmas cookies, free of charge! We also have live animals for your family to enjoy. You-Choose and You-Cut varieties: Blue Spruce, Douglas Fir, White Spruce. Cerbo's Christmas Tree Farm - Christmas trees-you choose and you cut, Christmas wreaths, Hot chocolate, hayri71 Newton Ave Branchville, NJ. Phone: 973-886-5587. Open: Saturday and Sunday from 9 am to 5 pm. Make a holiday tradition and family memory and cut your own Christmas tree. Any tree, any size just $53. Over 12,000 trees with many sizes and varieties to choose from. Greens, homemade wreaths, and roping also available. 129 Plains Road, Augusta, NJ. Phone: 973-875-5590. Open: Thanksgiving Friday to Sunday from 9 am to 4 PM; Thereafter we are open Fridays from 12 pm to 4:00 and Saturdays and Sundays from 9 am to 4:00; Our last day of business is December 16th. Directions: Rte. 80W to Rte. 15N that ends at Rte. 206N at Ross's Corner (Sussex County-Frankford Twp.-Augusta). Go North on Rte. 206 1 mile to 1st light, turn right onto Plains Road. Go 2.4 miles on right. Also road Sussex County Farm & Horse Show/N.J. State Fair is on. U-Choose & Cut your own: Blue Spruce, Norway Spruce, White Spruce, Douglas-fir. 3 Gigi Lane, Branchville, NJ. Phone: 973-948-4306. Directions: Rte. 206 North to Upper North Shore Road (County Route 636), turn right 1.6 mi., turn left on Anne Lane. Follow signs. Open: Call them for 2019's dates and hours; I have not received an update from them in years; last reported hours were 9 am to 4 (Saturday and Sunday), December 4 - 12. U-Choose & Cut your own: Douglas-fir, Balsam Fir. 58 Whitehall Road, Andover, NJ 07821. Phone: 973-786-6023. Fax: 973-786-7709. Email: info@gardensoftheworld.com. Open: Monday to Friday from 8 am to 5 pm, Saturday from 8 am to 5 pm; closed on Sunday. Click here for current open hours, days and dates. Directions: Interstate Route 80 (east or west), Exit 19. Bear right off exit onto Route 517N. Go 5.5 miles. At stop sign make left onto Whitehall Road. Go 1/2 mile, we are located on the left. Click here for a map and directions. Payment: Cash, Check, Discover, AmEx. If you would like we will even tie it on the car. Living, rooted tree varieties: Colorado Blue Spruce, White Fir (Concolor Fir), Douglas Fir. 350 Route 94, Newton, NJ 07860. Phone: 973-820-5366. Email: mikegio1@optonline.net. Open: in 2018,Saturday and Sunday the three weekends prior to Christmas; 12/1, 12/2, 12/8, 12/9, 12/15 and 12/16. Click here for current open hours, days and dates. Directions: From the east, or south, travel to the intersection of routes 80 & 206 in Netcong. Continue north on RT 206 for 9 miles. Just after a traffic light, make a left onto Fredon Road (RT 618). Follow RT 618 to the end (2 miles). Make a right onto RT 94. The farm is 1/2 mile on the left (look for the billboards at the entrance to the farm) - .From the North, take RT 94 or RT 206 South into the center of Newton. Continue south on RT 94 for 2 miles. We are just south of Anderson Hill Road on the right. Click here for a map and directions. Payment: Cash only. Any tree, any size is $42.! We have more than 15,000 trees in the ground. We also have a beautiful 2 1/2 acre pond & more than 13 acres to roam around, pick your tree & enjoy the various wildlife. Feel free to bring your lunch & chair. Our staff of very friendly family members will be happy to help you get your tree on your vehicle & tie it down. We will have more than 1,000 trees up to 9 feet tall, and dozens up to 20 feet. Any tree, any size, only $42. Click here for our Facebook page. You-Choose and You-Cut varieties: Balsam Fir, Blue Spruce, Colorado Blue Spruce, Douglas Fir, Fraser Fir, Norway Spruce, Scotch Pine, White Spruce. 451 Route 94, Vernon, NJ 07461. Phone: 973-764-5144. Fax: 973-764-2868. Email: info@heavenhillfarm.com. Open: Christmas trees and Greenery daily Black Friday through December 24. Click here for current open hours, days and dates. Directions: Click here for a map and directions. Payment: Cash, Check, Visa/MasterCard, Discover, AmEx. Click here for our Facebook page. For All Your Holiday Decorating Custom Wreaths Trees Roping Blankets Centerpieces Poinsettias Santa Visits the Farm in 2017 on Dec 3 and Sun Dec 10, 12-4pm. 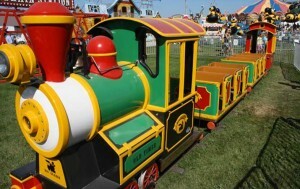 Holiday Train Rides on Saturdays & Sundays: Dec 2, 3, 9, 10, 16, 17: 12-4pm. Heaven Hill boasts 16,500 sq.ft. of retail & greenhouse space. The market is a full service garden center offering annuals/perennials, shrubs/trees, herb/veggie plants, outdoor furniture/gift ware, produce/baked goods, u-pick pumpkins, hayrides & more. 381 Ridge Road, Newton, NJ 07860. Phone: 908-637-6720. Alternate phone: 908-399-2492. Open: 10 am to 4 pm; weekends only, from after Thanksgiving to Christmas eve; Also open Black Friday. Directions: Route 80 West to exit # 25. Take 206 North for 9 miles to Springdale. Take left on Fredon Road (618 West) at A & B Bagel/ Greeks Package Goods. Go 2 miles to 4 way intersection. Make right on Route 519 North. Go 3/10 of a mile. Farm is on right. And for a map to our farm, click here. . Payment: Cash, only. 2,500 Choose and cut Christmas Trees available. Average size 6 to 12 feet. Pull your car right up to the edge of the Christmas Tree Farm. Trees baled by "Shaky Lady." Saws and rope provided. 150 Hunts Pond Road, Fredon, NJ. Phone: 973-383-5873. Open: Call before you go; I haven't had an update from them in years; 10 am to 4 (Saturday and Sunday), December 2 to December 10. Directions: From Blairstown-Rte. 94 N. 8 mi.-rt. @ Frank Alberta's Restaurant onto Fredon-Greendel Road OR from Newton - Rte. 94 S 5 miles - left @ Frank Alberta's Restaurant, 0.5 mile on Fredon-Greendel Road - turn right (Hunt's Pond Road)0.9 mile to farm on right. U-Choose & Cut your own: Blue Spruce, Norway Spruce, White Spruce, Douglas-fir, Concolor Fir. 25 Statesville Quarry Rd, Lafayette, NJ 07848. Phone: 973-383-8682. Email: info@hilltopgreensnj.com. Open: Saturday 9:30 am to 4 pm and Sunday 11 am to 4 pm starting Friday after Thanksgiving November27th; then from 9:30 am to 4 pm on to the next 4 weekends. Click here for current open hours, days and dates. Directions: 1/4 mile in off route 15 on Statesville Quarry road long driveway to the top of the hill. Click here for a map and directions. Payment: Cash, only. Click here for our Facebook page. U-Choose & Cut your own: Norway Spruce, Douglas-fir, Canaan Fir. Rts. 15 & 206 (Ross' Corner), Lafayette, NJ. Phone: (973) 579-3893. Email: ideal@ptd.net. Open: Daily 9 am to 5 pm. Directions: From Route 80, Exit 34B (Route 15N), Located on Route 15 N before intersection of Route 15 & Route 206. Open: 9 am to 5 pm; winter hours: Thurs. - Sun. 9 am to 4 pm. There is also a roadside market with Asparagus; beans; corn; tomatoes; peppers; other produce. Gift shop; picnic area; gourds; antique reproduction furniture dept. ; area's largest selection of Amish lawn furniture; indoor & outdoor home decor items; cards; candles; baskets; pottery; bakery; herd of friendly goats. Current Events . Seasonal Information . What's Sold ..
161 Rose Morrow Road, Wantage, NJ 07461. Phone: 201-400-7458. Email: indianridgefarms@gmail.com. Open: Thursdays, Fridays, Saturdays, Sundays and Mondays from 9 am to 5 pm beginning the day after Thanksgiving. Click here for current open hours, days and dates. Directions: Route 23 North through Sussex. Pass Tractor Supply on right. Take third right onto Central School Road and follow 1.8 miles to end. Turn right on to Rose Morrow Road. We are .2 miles ahead on the right. Click here for a map and directions. Payment: Cash, Check. You-Choose and You-Cut varieties: Blue Spruce, Canaan Fir, Douglas Fir. PreCut varieties: Balsam Fir, Blue Spruce, Canaan Fir, White Fir (Concolor Fir), Douglas Fir, Fraser Fir, Grand Fir, Red Pine, White Fir (Concolor Fir). 418 Route 515, Vernon, NJ. Phone: 973-764-6137. Email: platzpt@warwick.net. Open: Please call ahead; Summer - Fall, July - Mid-October (first frost). Also Available: Cord wood (cut & split to order by the cord or bundles) Containerized Spruce & Fir Trees. Potted spruce and fir trees grown at Mount Vernon Farms located in northern New Jersey's scenic Sussex County. Variety of sizes. Local delivery (Vernon) available.High-quality, dry, seasoned firewood. Local delivery (Vernon) available. 50 Rte. 521, Hampton, NJ. Phone: 973-383-2666. Open: 9 am to 4 (Saturday and Sunday), from the day after Thanksgiving to December 17. Directions: From Newton take Rte. 622W (approximately 7 mi.). Just after entering Swartswood State Park, make right on Frank Chandler Road. 1 mile to Rte. 521 intersection. Left on Rte 521S. 3/8 mile to farm on left. U-Choose & Cut your own: Blue Spruce, Douglas-fir, Scotch Pine. 100 Layton Road, Wantage, NJ 07461. Phone: 973-600-1380. Fax: 973-875-6098. Email: treesgardens2@yahoo.com. Open: on the following weekend dates only, from 9 am to 4 pm: November30th and December 1st; December7th & 8th; December 14th and 15th, and December 21 and 22nd. Directions: Sussex- take Route 23 North 2 1/4 mile, Tractor Supply on right make right on Ryan Road go 1/2 mile, make left onto Layton Road, go 1/3 mile farm on left. Look for tree signs From Route 284 North, go 2 miles, make first left on 284,(Layton Road) follow Layton Road, farm on left. Look for tree signs. Click here for a map and directions. Payment: Cash, only. You-Choose and You-Cut varieties: Colorado Blue Spruce, Douglas Fir, Eastern White Pine. 144 W. Owassa Turnpike, Frankford Twp., NJ. Phone: (918) 272-9445. Email: owassotreefarm@yahoo.com. Open: from the Saturday prior to Thanksgiving to December 23rd; 9 am-7pm on weekends, and from 1-7pm on Monday-Friday; Closed on Thanksgiving Day. Directions: From Branchville, Rte. 206 North 3 miles Turn left at the Blue Ribbon restaurant on to route 521 South and proceed one mile to farm on the left. U-Choose & Cut your own: Blue Spruce, Douglas-fir. 260 Meyer Road, Branchville, NJ. Phone: 973-875-5349. Directions: Rte. 80W to Rte. 15 N (Exit 34B) to intersection of Rtes. 15/206/565. Right turn onto Rte. 565N. Go 3.7 miles to Plains Road. Turn left, take 2nd right - Meyer Road Or from Sussex: (Rte. 23), take Rte. 639S to Rte. 565S 5 miles to Plains Road. Turn right - take 2nd rt - Meyer Road. Farm is 1 mile on left. Open: 10 am to 4, daily, from the day after Thanksgiving to December 16. 84 County Route 560, Layton, NJ 07851. Phone: 973-948-3506. Email: jedgerly22@gmail.com. Open: Weekends 9 am to 4 pm from Thanksgiving through December or call to make a weekday appointment. Directions: From NYC & East, Route I80, to Route 15N, to Route 206N, past Branchville & Stokes State Forest. At the bottom of the hill, turn left on to Route 560 toward Layton and Dingman's Ferry Bridge. Farm is less than 2 miles on the right, just before Sandyston-Walpack Consolidated School. From points North & West: In Milford, PA take Route 209S to toll bridge into NJ. Follow NJ Route 206S almost 3 miles to Route 645 (Layton-Hainesville Rd). Follow about 4 miles to the T, turn left onto Route 560. Farm is on the left. Our products are usually available in November, December. Payment: Cash, Check. Got questions? Just call or email. Need help at the farm? Just ask. This is a NJ Farmland Preservation Farm. You-Choose and You-Cut varieties: Blue Spruce, White Spruce. 455 Route 515, Vernon, NJ 07462. Phone: 201-618-9802. Open: weekends (Saturdays and Sundays) in December from 9 am to 4 pm; closing for the season in mid December see their Facebook page for exact dates and updates. Directions: 7.5 miles in on route 515 north from route 23 north, from route 94 south follow sign for route 515 south 1 mile passed the traffic light in Vernon by the Burger king. Click here for a map and directions. We do not use pesticides on the crops. Payment: Cash, Check. After cutting your trees come to the warm barn for the family's famous hot apple cider. Stehli trees also make their own grave blankets, kissing ball and and mini trees for taking to loved one not able to have and large tree. We also carry Meyers spruce. We are a farm that does no spraying of chemical - only organic. We use integrated pest management (IPM) techniques, instead so we can remain environmentally friendly. You-Choose and You-Cut varieties: Balsam Fir, Blue Spruce, Canaan Fir, Colorado Blue Spruce, Douglas Fir, Eastern Red Cedar, Fraser Fir, White Fir (Concolor Fir), White Spruce, and other varieties (call!). 297 Route 206 S, Andover, NJ. Phone: 973-383-2470. Email: osb@newtonosb.org. Directions: 8 miles N. of Route 80. Exit 25. 1 mile S. of the town of Newton. Open: 9 am to 4, daily, from the day after Thanksgiving to December 23. U-Choose & Cut your own: Blue Spruce, White Pine, Douglas-fir, Concolor Fir, Scotch Pine. 350 Route 94, Newton, NJ 07860. Phone: (973) 820-5366. Email: info@timbervalleytreefarm.com. Open: Hours vary considerably; please see our website or Facebook page for current availability and hours. Directions: Click here for a map and directions. Payment: Cash, Debit cards, Visa/MasterCard, Discover. Click here for our Facebook page. Please like our facebook page for future events at Timber Valley. U-Choose and Cut varieties: Canaan Fir, Colorado Blue Spruce, Fraser Fir, Norway Spruce, White Spruce. You Choose and We cut varieties: Colorado Blue Spruce, Fraser Fir, Norway Spruce. 10 Tranquillity Farms Lane Route 517, Andover, NJ 07821. Phone: 908-979-0303. Fax: 908-979-0303. Email: tranqfarms@yahoo.com. Open: Monday Through Sunday, From 9 am to 6 pm, December 1 to December 31. Click here for current open hours, days and dates. Updates: Click here for updates. Directions: Take Route 80 to Exit 19. Make a right off of the exit. We are located 1 mile on the right hand side. Click here for a map and directions. Fall Fest with corn maze, wagon rides and U-pick pumpkins is open on weekends from last weekend in September to October 31. We use integrated pest management practices. Payment: Cash, Debit cards, Visa/MasterCard, Discover. Click here for our Facebook page . All trees from Tranquillity Farms are drilled for the stand straight tree system for easy placement in your home with a straight tree every time! Tranquillity Farms also decorates wreaths in many size options including 8″, 12″, 16″, 32″ and 48″. Choose from the beautiful ones on the benches or have one custom made to match your house. Kissing Balls are also a great addition for winter decorations. Also available is roping, grave blankets and pillows, grave cones and centerpieces. WIC and Senior FMNP checks accepted. 65 Augusta Hill Road, Augusta, NJ. Phone: 973-383-5029. Directions: 4 miles N of Newton via Route 519 & Intersection of August Hill Road; From I-80, Exit 34B, N on Rt 15 20 miles To Route 206 N. to next light; Left on August Hill Road. Farm over hill on right at intersection of Route 519. Open: Mid May - October Wednesday to Sunday 10 am to 7:30 pm; Saturday after Thanksgiving to the Sunday before Christmas, daily 10 am to 4 pm, weekends 9 am to 5 pm. Trees can be chosen & tagged mid October to December 1; all grown on our farm (Christmas Trees/Wreaths). NOFA - NJ Certified Organic. Click here for a link to our Facebook page . Statesville Quarry Road, Lafayette, NJ 07848. Phone: 973-875-8387. 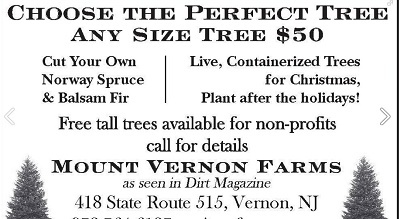 Email: Bill@NJChristmasTreeFarm.com. Open: Friday, Saturday, Sunday 11/25-11/27, then Saturday, Sunday 12/3-12/4, 12/10-12/11; CHECK WEBSITE OR CALL for updates; Hours are from 10 am to 4 pm. Click here for current open hours, days and dates. Directions: From Route 15 North go through the village of Lafayette past the Lafayette professional building to Statesville Quarry Road on your right. The farm is 2.5 miles on your left. Click here for a map and directions. Payment: Cash, only. We supply tree carts and saws to make your selection as easy as possible. Also there will be complimentary hot cider at the barn. You-Choose and You-Cut varieties: Canaan Fir, Colorado Blue Spruce, White Fir (Concolor Fir), Douglas Fir, Fraser Fir, Norway Spruce, White Fir (Concolor Fir), White Spruce, and other varieties (call!). You Choose and We cut varieties: Blue Spruce, Canaan Fir, Colorado Blue Spruce, White Fir (Concolor Fir), Douglas Fir, Fraser Fir, Norway Spruce, White Fir (Concolor Fir). 459 Powerville Road, Hainesburg, NJ. Phone: 908-496-4577. Directions: Driveway is on corner of Powerville and West End Road. Open: weekends in December . The cold weather finds the petting farm closed - we send our animals on winter vacation to our nearby farm where they enjoy lots more space and a large warm barn. We, however, continue to work getting ready for our favorite time on the farm, the opening of our "Cut your own Christmas tree" farm. After exerting all that energy finding and cutting your own tree, come watch Farmer Tina make fresh mini donuts. Tea, hot chocolate, coffee, delicious hot apple cider and donuts are available to purchase. You won't feel too guilty indulging in the donuts after all that work! They are truly delicious! Please check the Brook Hollow BarnyardFacebook for dates and pricing. 108 Union Brick Rd, Blairstown, NJ 07825. Phone: 908-459-5633. Open: 7 days a week 9 am to 5 pm, the day following Thanksgiving until 21 December. Directions: exit 12 I-80, north on 521 towards Blairstown, left on Heller Hill rd, at stop sign make left on Union Brick rd, 1.4 miles on right. Evergreen Knolls. Click here for a map and directions. Payment: Cash, only. You-Choose and You-Cut varieties: Balsam Fir, Blue Spruce, Colorado Blue Spruce, Douglas Fir, Fraser Fir, Noble Fir, Norway Spruce, White Fir (Concolor Fir), White Spruce. 77 Jackson Valley Road, Washington, NJ 07882. Phone: 908-835-0557. Fax: 609-397-1686. Email: frstree@comcast.net. Open: Beginning the day after Thanksgiving; Daily from 9 am to 4:30 pm; Closed Mondays. Directions: Click here for a map and directions. Payment: Cash, Debit cards, Visa/MasterCard, Discover, AmEx. You Choose and We cut varieties: Blue Spruce, Canaan Fir, Colorado Blue Spruce, White Fir (Concolor Fir), Douglas Fir, Eastern White Pine, Fraser Fir, Norway Spruce. 131 Greendell Road, Newton, NJ 07860. Phone: (908) 852-5362. Email: dobesrule2@hotmail.com. Directions: Rt.80 to exit 19-make a right onto 517N. go 2 and a half miles and make a left onto 611. Stay on 611 for 2 and a half miles and make first left after the Green Twsp. fire house onto Hamilton Road. farm is 1 3/4 miles on right.. Our products are usually available in November, December. Open: Saturday and Sunday 9 am to 4 pm; Open weekends from Thanksgiving to Christmas. Payment: Cash, only. You-Choose and You-Cut varieties: Blue Spruce, Eastern White Pine, Fraser Fir, Norway Spruce, White Fir (Concolor Fir), White Pine. 2 Glenview Lane, Blairstown, NJ. Phone: 908-362-6904. Email: glenviewfarm@embarqmail.com. Open: 1Friday to Sunday from 8 am to 4:30 pm, from the day after Thanksgiving to mid-December. Directions: I-80 Exit 12 N. - Rte. 521 - 4 miles to Blairstown, left on Rte. 94 - 1 mile to Mohican Road; From Newton - Rte. 94 S. 12 miles to Mohican Road 4 miles - right on Gaisler Road - farm 1 mile; for a map, click here. U-Choose & Cut your own: Blue Spruce, Norway Spruce, Douglas-fir, Concolor Fir, Fraser Fir, Canaan Fir. Comments from a visitor on December 14, 2010: "My husband and I went to Glenview Farm from NYC to cut a tree yesterday, and were very impressed with the place. First they had an enormous amount of healthy trees, offering many varieties. We have been to many tree farms through out the tri-state region, and agreed that this was the best that we have ever visited. The price was fair, and the same for a 7ft or 10 ft, a deal for the larger trees. Also the location was lovely, as was the surrounding countryside, which made for a pleasant drive. The owner was friendly and helpful.... "
196 Alphano Road, Great Meadows, NJ. Phone: 908-637-4927. Email: godlewskyfarms@yahoo.com. Directions: Off Route 46 or Route 80, 3-1/2 miles on Alphano Road ; sod; wetland plants; trees; shrubs; ground covers; fruit trees & shrubs. 312 Naughright Road, Long Valley, NJ 07853. Phone: 908-850-1483. Fax: 908-979-1953. Directions: From 280 East. Take exit 26 Budd Lake. Continue on Route 46 West. Make a left at Naughright Road. Continue 2.5 miles. Granatas Nursery will be on your left. Open: Hours Of Operation Monday to Sunday, 9 am to 5 pm. Payment: Cash, Check, Visa/MasterCard. You Choose and We cut varieties: Blue Spruce, Douglas Fir, Norway Spruce, Ponderosa Pine. PreCut varieties: White Pine, White Spruce. Living, rooted tree varieties: Blue Spruce, Douglas Fir, Norway Spruce, Ponderosa Pine, White Pine, White Spruce. 23 Beidleman Road, Broadway, NJ. Phone: 732-735-7829. Directions: Rte 31 to 57 W 3.1 mi. to Beidleman. Turn left on Beidleman Road. Farm is 500 ft. on left. Open: 10 am to 5 (daily), November 21 to December 21. 18 Spring Lane, Washington, NJ. Phone: 908-689-5678. Open: Call before you go; I haven't see an update from them in years; 10 am to 5 (Friday, Saturday, Sunday), Saturday after Thanksgiving to December 17. Directions: From Washington, take Rte. 57W to right onto Brass Castle Road. Go 1 and 1/2 miles to Rte. 647 on left. Go 1 mile up hill. From Rte. 80 at Hope, take Rte. 519 S to left on Rte. 623 (Brass Castle Road)Go 4 miles to Rte. 647 on right. Follow green tree signs. U-Choose & Cut your own: Blue Spruce, Norway Spruce, White Spruce, Douglas-fir, Concolor Fir, Balsam Fir. 438 Route 57 West, Washington, NJ 07882. Phone: 908-267-5313. Email: HorseSleighFarm@aol.com. Open: NOTE: their website is down this year, and their facebook page is "unofficial", so they may - or may not be open - CALL BEFORE you go - November 25th to December 23rd Monday to Closed to public Tuesday to Closed to public Wednesday to 12 pm to 8 pm (Santa Available 3 pm to 8:00 pm) Thursday to 12 pm to 8 pm (Santa Available 3 pm to 8:00 pm) Friday to 11 am to 9 pm (Santa Available All Day) Saturday to 11 am to 9 pm (Santa Available All Day) Sunday 11 am to 9 pm (Santa Available All Day). Click here for current open hours, days and dates. Directions: Only 45 minutes West of New York City and 1 Hour North of Philadelphia. Click here for a map and directions. Payment: Cash, Check, Debit cards, Visa/MasterCard, Discover. Click here for our Facebook page. 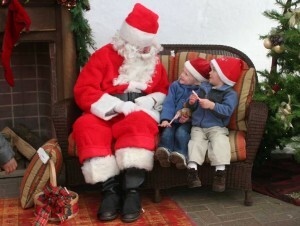 Santa's Village with Live Santa and Pictures, Sleigh Rides, Christmas Trees, Gift Shop & More. 55a Primrose Road, Hardwick, NJ 07825. Phone: (973) 945-4725. Alternate Phone: (908) 362-9557. Email: kingfisherfarm@gmail.com. Open: Thanksgiving To Christmas; Weekends from 9 am to 5 pm; Monday to Friday call for hours of operation. Click here for current open hours, days and dates. Updates: Click here for updates. Directions: Directions: Route 80 to Exit 12 to 521 North, right onto Route 94 North to Marksboro, left onto Spring Valley Rd, right onto Primrose Rd. Click here for a map and directions. Setting out to find the perfect Christmas tree is a wonderful experience in which beautiful memories are made with family and friends. Payment: Cash, only. Welcome to Kingfisher Farm where you can start your Christmas Season with a beautiful Fraser Fir, Douglas Fir, Norway Spruce, Concolor Fir or White Spruce. You-Choose and You-Cut varieties: Blue Spruce, Douglas Fir, Fraser Fir, Norway Spruce, White Fir (Concolor Fir), White Spruce. You Choose and We cut varieties: Blue Spruce, White Fir (Concolor Fir), Douglas Fir, Norway Spruce, White Fir (Concolor Fir), White Spruce. 113 Hope Crossing Road, Belvidere, NJ 07823. Phone: 908-475-4441. Open: Saturdays and Sundays from 10 am until dusk, from the weekend after Thanksgiving through Christmas. Click here for current open hours, days and dates. Directions: Click here for a map and directions. Payment: Cash, Check. Please visit our web site for more information. You-Choose and You-Cut varieties: Douglas Fir, Fraser Fir, Norway Spruce. You Choose and We cut varieties: Douglas Fir, Fraser Fir, Norway Spruce. 284 County Road 519 Alternate for GPS: 284 South Bridgeville Road, Belvidere, NJ 07823. Phone: 908-475-1507. Email: cider@fast.net. Open: 7 days a week from 9 am to 5:30 pm beginning the day after Thanksgiving until Noon on Christmas Eve; We close for the season at noon on Christmas Eve. Updates: Click here for updates. Directions: Turn by turn directions can be found on our website. Essentially we are half way between Interstate 78 and Interstate 80. Route 80 is easier (fewer turns). Click here for a map and directions. Payment: Cash, Check, Debit cards, Visa/MasterCard, Discover, AmEx, WIC Vouchers, SFMNP Vouchers. Click here for our Facebook page. During the Christmas season, we work with two other local farms, Wyckoff's Christmas Tree Farm and Four Sister's Winery, to create a "Christmas in the Country Trail". Visit all three of us, spend $5 at each, and receive a set of dated Christmas wine glasses. Start a new family tradition! For more information see Christmas in the country trail.com. The day after Thanksgiving begins our Christmas season We have hundreds on pre-cut Christmas Trees to choose from. You will also find a huge selection of custom decorated wreaths, kissing balls and grave decorations to fit your taste and decor. We will have a limited selection of Grave Decorations available the week of Thanksgiving. 41 Mt. Bethel Road, Port Murray, NJ. Phone: 908-852-5811. Directions: Washington - Rte. 57 E - 4 miles to light - left on Rte. 629 - 1 and 1/2 miles - right on Rockport Road - 1/2 mile - left on Mt. Bethel Road - 300 yds. to farm; From Hackettstown - Grand Ave./Rte. 629 off Rte. 46 - 6 miles - right on Mt. Bethel Road. Open: 9 to dusk (Thu - Sunday), from the day after Thanksgiving to December 23. Labor Day on, Tag anytime! U-Choose & Cut your own: Blue Spruce, Norway Spruce, Douglas-fir. 999 Us 22, Phillipsburg, NJ 08865. Phone: 908-387-1225. Alternate Phone: 908-763=1945. Email: curtistreefarm@gmail.com. Open: Starting after Thanksgiving; daily from 10 AM to 8 PM except on Sunday when we close at 6; If you want to cut your own tree, you'll need to get here by 4 pm, so you can pick your tree and get it loaded. . Click here for current open hours, days and dates. Directions: Take I-78 to exit 3 toward Phillipsburg. Go 2.4 miles. We are on the right. Look for parking lot and sign. Click here for a map and directions. Payment: Cash, Check, Debit cards, Visa/MasterCard, Discover, AmEx. Click here for our Facebook page. You-Choose and You-Cut varieties: Afghan Pine, Balsam Fir, Blue Spruce, Canaan Fir, Colorado Blue Spruce, Douglas Fir, Fraser Fir, Grand Fir, Leyland Cypress, Nordmann Fir, Scotch Pine, Turkish Fir, White Fir (Concolor Fir), White Pine, and other varieties (call!). You Choose and We cut varieties: Austrian Pine, Balsam Fir, Blue Spruce, Canaan Fir, Colorado Blue Spruce, White Fir (Concolor Fir), Douglas Fir, Eastern White Pine, Fraser Fir, Grand Fir, Nordmann Fir, Scotch Pine, Turkish Fir, and other varieties (call!). PreCut varieties: Austrian Fir, Balsam Fir, Blue Spruce, Canaan Fir, Colorado Blue Spruce, White Fir (Concolor Fir), Douglas Fir, Fraser Fir, Grand Fir, Noble Fir, Nordmann Fir, Scotch Pine, Turkish Fir, White Fir (Concolor Fir), and other varieties (call!). 426 Route 31N, Washington, NJ 07882. Phone: 908-362-1375 . Email: plutstreefarm@embarqmail.com. Open: Wednesday and Thursday 10 am to 9 pm; Friday and Saturday 9 am to 9 pm; Sunday 9 am to 6 pm; At times hours may be altered due to inclement weather conditions, Please call first; Open day after Thanksgiving through Christmas Eve. Directions: We are located 2-1/2 miles south of the center of Washington (routes 31 and 57) at 426 Route 31 (northbound side)-look for the white fence. Click here for directions. Payment: Cash, Check. You-Choose and You-Cut varieties: Blue Spruce, Douglas Fir, Fraser Fir, Serbian Spruce. 4 Morris La, Great Meadows, NJ. Phone: 908-637-6426. Directions: Rte. 46 W in Great Meadows, turn right onto Hope Road (Route 611) at St. Peter & Paul Church, 3/4 mile turn left onto Mt. Lake Road, 1 mile to farm on left. From Rte. 80, take Hope-Blairstown Exit 12, into Hope, turn left at light, go 1 block and Turn right onto Hope/Great Meadows Road (Route 611). Go 4 miles (past "Land of Make Believe"), turn right onto Mt. Lake Road, 1 mile to farm on left. Open: 8 am to 4:30 pm (Saturday and Sunday), November 4 to December 17 . U-Choose & Cut your own: Norway Spruce, Douglas-fir, Concolor Fir, Fraser Fir, Canaan Fir. 21 Frontage Road, Blairstown, NJ. Phone: 908-459-4048. Email: roytruh@yahoo.com. Open: after Thanksgiving on Friday at 9 am; then hours are 9 am until 4:30 pm on Friday thru Sunday, and 11 am until 4:30 pm on Monday thru Thursday; If these dates and times do not work for you, please give us a call. Directions: I-80 (Exit 12) towards Hope - 1/4 mile - right on Foundry Road 1/2 mile to end - right on Mt. Hermon Road. 3 miles to bridge over I-80 to an immediate right onto Frontage Road. .
U-Choose & Cut your own: Blue Spruce, Norway Spruce, Douglas-fir, Concolor Fir. 42 Frog Pond Road, Columbia, NJ 07832. Phone: 908-496-4510. Alternate Phone: 908-797-4341. Fax: 908-496-4510. Email: jam01@ptd.net. Open: Thursday to Sunday, from 9 am to 4:30 pm, the Friday after Thanksgiving to December 24. Directions: Route 80 exit 4 to Route 94 north towards Blairstown, proceed 3.5 miles. Take left onto Frog Pond Road, proceed .5 miles. Our farm is on the left, number 42, you will see the field of Christmas trees. Click here for a map and directions. Payment: Cash, Check, Debit cards, Visa/MasterCard, Discover, AmEx. Hand made wreaths and grave blankets available. We also have home made chocolate,carmel covered apples and pretzels, and an assortment of baked goods. You-Choose and You-Cut varieties: Blue Spruce, Canaan Fir, Colorado Blue Spruce, Fraser Fir, Norway Spruce, White Fir (Concolor Fir). Living, rooted tree varieties: Black Hills Spruce, Blue Spruce, Canaan Fir, Colorado Blue Spruce, Norway Spruce. 118 Beechwood Road, Belvidere, NJ 07823. Phone: 908-453-2818. Email: tandmdunne@embarqmail.com. Open: Friday, Saturday and Sunday from 9 am to 4:30 pm, or by appointment, beginning beginning the Friday after Thanksgiving. Directions: From the 46 and 31 intersection in Buttzville, travel 1/4 mile west on 46 to your first right Green Pond Road. Turn right onto Green Pond Road and go 1/4 mile to your first right Beechwood Road. Turn right onto Beechwood Road and go 1/2 mile to the farm on your left. Payment: Cash, Check. We are a new, small, choose and cut farm opening for the first time in 2010. You-Choose and You-Cut varieties: Canaan Fir, Douglas Fir, Fraser Fir, Norway Spruce, White Pine. 249 County Road 519, Belvidere, NJ 07823. Phone: 908-475-4508. Email: jswyckoff@embarqmail.com. Open: Friday After Thanksgiving through December 24th, daily, 8 am to 4:30pm; Hayrides on Weekends, weather permitting. Click here for current open hours, days and dates. Directions: Click here for directions and once you arrive, you'll want this map of the farm . Payment: Cash, Check, Visa/MasterCard. Credit Cards weekends only. Free baling, and drilling. Fresh cut trees also available. We now accept Visa and MasterCard. We have several special events planned each year. Please see our website for a listing of special events.